Many methods for scatter correction of SPECT images have been proposed by several investigators. ,,,,,,,, Some of them are based on a spectral analysis that is performed by setting additional energy windows in 99m Tc spectrum, and others rely on a spatial analysis that is implemented by convolution and deconvolution procedures. In this study, six scatter correction methods from the first category are individually evaluated. These methods consist of dual-energy window (DEW) method, photopeak energy distribution analysis (PEDA) method, dual-photopeak window (DPW) method, cannel ratio method (CRM), and three energy window (TEW) methods (trapezoidal and triangular approximation). 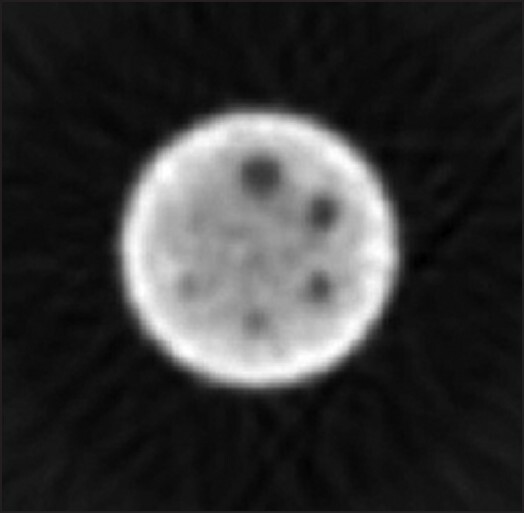 A cold-sphere hot-background phantom including six spheres with different diameters is simulated to generate the projection images for the different energy windows and evaluate each of the scatter correction methods based on the change resulted in image contrast, signal-to-noise ratio (SNR), and relative noise of the background (RNB) for each of the cold spheres. The underlying assumptions for each of the scatter correction methods are described below. In all of these methods, a 126-154 keV energy window centered on 140 keV is used as photopeak energy window (W pk ). It is common to use a k valve of 0.5 proposed originally by Jaszczak et al.,  but since the k value depends on the phantom and imaging situation used, we individually calculate this value here. It is obvious that this subtraction results in removing some unscatter events as well as the scatter events. The essential step in this method is to determine the cut-off energy between subwindows 1 and 2 so that for each pixel, the ratio of the scatter counts detected in two subwindows is as close as possible to unit. In this way, the parameters G(i,j) and H(i,j) are calculated for each pixel in the projection images. where G and H are the mean values calculated for the two parameters G(i,j) and H(i,j). In this method, the scatter correction is performed directly and without need to estimate the photopeak scatter component. where T nw1 and T nw2 denote the total counts detected in the left and right narrow energy windows, respectively. Two narrow windows with the equal widths (w nwl = w nw2 = 2 keV), centered on E 1 = 126 keV and E 2 = 154 keV, respectively, are used for this correction method. 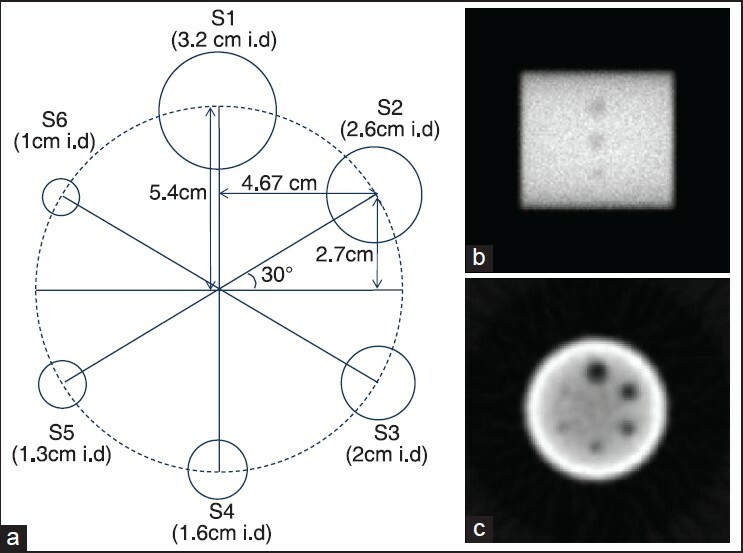 For evaluation of the different scatter correction methods, a cold-sphere hot-background phantom containing six water-filled spheres (labeled as S1-S6 in [Figure 1]) with diameters 3.2, 2.6, 2, 1.6, 1.2, and 1 cm placed in a 99m Tc uniformly filled cylindrical phantom (diameter 20 cm and height 22 cm) is simulated using SIMIND Monte Carlo simulation program. The centers of these spheres are located at the plane passing from the half-height of the cylindrical phantom and the radial distance of them from the axis of the cylinder is equal to 5.4 cm [see [Figure 1]. In this study, the simulated SPECT system has been equipped with a low-energy high-resolution (LEHR) collimator. One hundred and twenty-eight projections (matrix size 128 × 128 and pixel size 0.3 cm) are acquired at equidistant angles in a 360° camera rotation with a radius of rotation 20 cm that is same for all of the simulations in this study. Using the SIMIND Monte Carlo simulation, the projections related to the different energy windows required for the six scatter correction methods are generated. For any energy window sitting, the SIMIND simulation is able to create the scatter projection images containing only the scattered photons, as well as the total (scatter + unscatter) projection images. The unscatter projections can be obtained by subtracting the scatter projections from the total projections. The scatter correction methods are programmed in MATLAB environment. The corrected projections are reconstructed by filtered back-projection method using Hann filter. Finally, the reconstructed images from the different scatter correction methods are evaluated using assessment criteria described below. Before the use of the assessment criteria, the regions of interest (ROIs) used for the calculation of these criteria are must defined. In this study, the ROI for each cold sphere is defined as all of the pixels that have located entirely inside and far from the edges of the circle of the sphere. Based on this definition, the ROIs for cold spheres with diameters 3.2, 2.6, 2, 1.6, 1.3, and 1 cm consist of 52, 30, 16, 12, 6, and 2 pixels, respectively. For background, the ROI consists of 256 pixels ranging from row 57 to 72 and column 57 to 72. The program related to each assessment criterion is also written in the MATLAB environment, and the evaluation and comparison between the different correction methods is performed based on these criteria. In this section, we describe the results obtained from each of the scatter correction methods individually. The essential step in the DEW method is the calculation of the k value. This value can be calculated by pixel-by-pixel dividing the photopeak scatter projections by the corresponding projections acquired through the Compton window. A typical projection's ROI (33:96, 30:99), covering the entire area of the cylindrical phantom in the projection, is used for the calculation of the k value. Since the k values calculated for the different pixels in a projection image are somewhat difference, therefore, it is necessary to average the k values calculated for the different pixels and projections. The k values obtained in this study have been ranged from the minimum value 0.1615 to the maximum value 0.7444 with a mean value 0.4252 and a SD of 0.0515. Also, a linear fitting between the pixel counts of the photopeak scatter projection, S pk (i,j), and the pixel counts of the Compton projection, T C (i,j), has been shown in [Figure 2]. The results of the simulation indicate that 98.6% of the photons detected in the Compton window are scattered photons and 44.4% of them undergo multiple scattering; whereas, only 13.1% of scatter photons detected in the photopeak window are multiple-scattered photons. Also, the reconstructed images from the true scatter component in the photopeak window and the scatter component estimated by the DEW method indicate that there are some differences between these two images [see [Figure 3]. The estimated scatter component image is approximately uniform so that it is not possible to detect the location of the spheres; whereas, the true scatter component image is noisy and the location of the spheres is somewhat detectable. Therefore, the subtraction of estimated scatter projections from corresponding photopeak projections results in some errors in the corrected images. The results obtained show that the DEW method improves the image contrast of cold sphere 1, 2, 3, 4, and 5 about 22.6, 21, 17, 10.5, and 6%, respectively [see [Table 1]. The RNB for the uncorrected and the corrected images is 0.0312 and 0.0454, respectively that show the scatter correction by the DEW method results in the increase of the image noise. Also, the SNR, for cold sphere 1, 2, and 3 is slightly lower and for cold sphere 4 and 5 slightly higher than the uncorrected images [see [Table 2]. Based on the description offered for this method, two subwindows with the approximately equal scatter counts for any pixel must be determined within the photopeak window. The consideration of the different subwindows indicates that the optimal cut-off energy between two subwindows is 133.5 keV. Therefore, the subwindows w 1 = 126-133 keV and w 2 = 134-154 keV with the number of scattered photons 436 and 444, respectively are chosen as most appropriate for this purpose. The mean value, SD, minimum and maximum values of the ratio S 1 (i,j) to S 2 (i,j) for seven projections in the projection's ROI (33:96, 30:99) are given in [Table 3]. 47.7% of detected photons in the lower subwindow (w 1 ) are the unscattered photons, including ~11.3% of the photopeak unscattered photons. Therefore, the subtraction in the PEDA method removes some unscattered photons that results in the significant reduction of the SNR in the corrected image. The PEDA method improves the image contrast of cold sphere 1, 2, 3, 4, and 5 about 26, 19, 12, 8.5, and 8.6%, respectively. The RNB for the corrected images is 0.0543. The SNR, for all of the cold spheres except for sphere 5 is lower than the uncorrected images. Using the photopeak scatter and scatter-free projections generated by SIMIND Monte Carlo simulation, it is possible to calculate the ratio of the photopeak scatter counts to the photopeak unscatter counts (scatter fraction) for each pixel, SUR(i,j). The plot of the SUR(i,j) against R(i,j) for a typical projection has been shown in [Figure 4]. The values of parameters A, B, and C resulting from the nonlinear regression fitting for the projection's ROI are −0.276, −1.429, and 0.4595, respectively. As shown in [Figure 5], for a typical projection, the majority of the pixel values of the calculated SUR in the regions near to the edges of the phantom are higher than that of the true SUR (overestimation); whereas in the central regions of the phantom, the state is vice versa (underestimation). It is also obvious that the amount of variation among the pixel values of the calculated SUR (SD ~0.02) is lesser than that of the true SUR (SD ~0.05). Therefore, it seems that the nonlinear regression fitting [Eq. 5] cannot estimate the scatter fraction of the photopeak window correctly. From the data of [Table 1], it is obvious that the improvement in the image contrast of the cold spheres is negligible so that it is only 4% for the largest sphere. As shown in [Figure 6], the structure of the reconstructed image from the photopeak scatter component estimated by the DPW method is similar to the structure of the reconstructed image from the total counts of the photopeak window, and therefore the subtraction in the DPW method cannot reduce the number of counts within the sphere's ROI significantly. Thus, it can be understood why the DPW method does not improve the image contrast greatly. On the other hand, the SNR for all of the cold spheres has been increased [see [Table 2] that shows the DPW method results in reduction of variation among pixel values and thereby reduction of SD in the background's ROI. For this reason, the RNB for the corrected image (RNB ~0.03) is slightly lower than that for the uncorrected image. The first step for use of the CRM is the calculation of the parameters G and H. The mean value, SD, minimum and maximum values calculated for these two parameters in three different ROIs have been given in [Table 4]. The data of this table show that the SD of the parameter H is relatively big showing the big variations in the H values from a pixel to another pixel that can lead to significant errors in the corrected images using the mean H value. As the previous scatter correction methods, the mean values of G and H calculated for first ROI (33:96, 30:99) are used for the scatter correction. From [Table 1], it can be understood that the use of CRM leads to improve the image contrast of cold sphere 1, 2, 3, 4, and 5, about 24.5, 13.9, 10, 11, and 4.9%, respectively. The improvement in the image contrast of sphere 4 is somewhat larger than that of sphere 3 that shows the nonuniform performance of this scatter correction method. The RNB for the corrected images is 0.0538 that causes the SNR, for all of the cold spheres except for sphere 5, become lower than the uncorrected images. Since the SIMIND can generate the projections containing only the scattered photons in the photopeak window, it is possible to study the true scatter spectrum of the photopeak window and thereby estimate the area of this spectrum using some approximate methods. 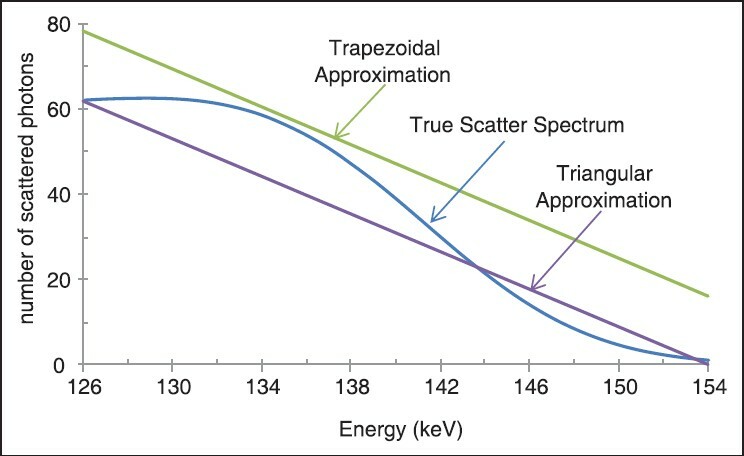 The spectrum of the photopeak true scattered photons along with the estimated spectra using two approximations, trapezoidal and triangular approximations, is shown in [Figure 7]. The number of scattered photons, corresponding to the area under the true total scatter spectrum of the photopeak window is equal to 937. TEW1. 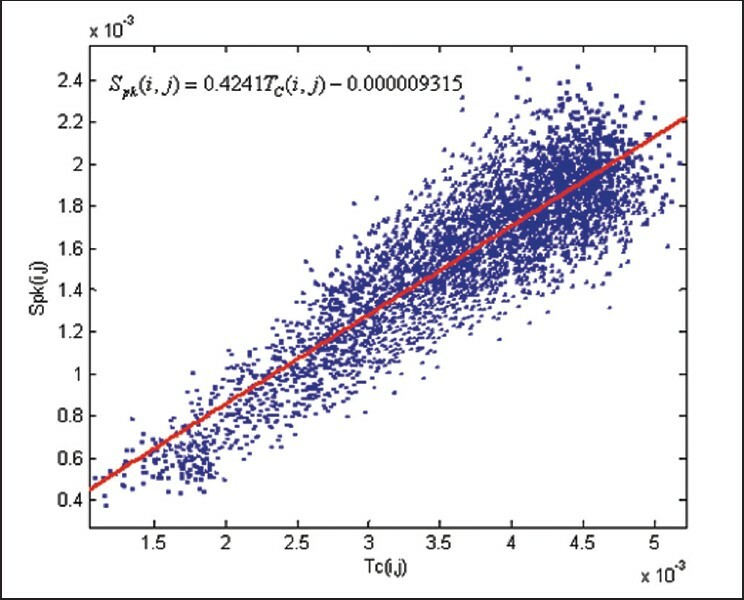 The number of scatter photons estimated using the trapezoidal area defined by this approximation is 1,323.7 representing an overestimation about 41.27%. This overestimation results in the high image noise (RNB = 0.0727), and thereby the significant reduction of the SNR for all of the cold spheres in the corrected images as compared to that for the uncorrected images. The improvement in the image contrast resulting from this method for the sphere 1, 2, 3, 4, and 5 is about 24.6, 17, 4, 14, and 2.7% respectively, showing a nonuniform correction similar to the CRM. TEW2. 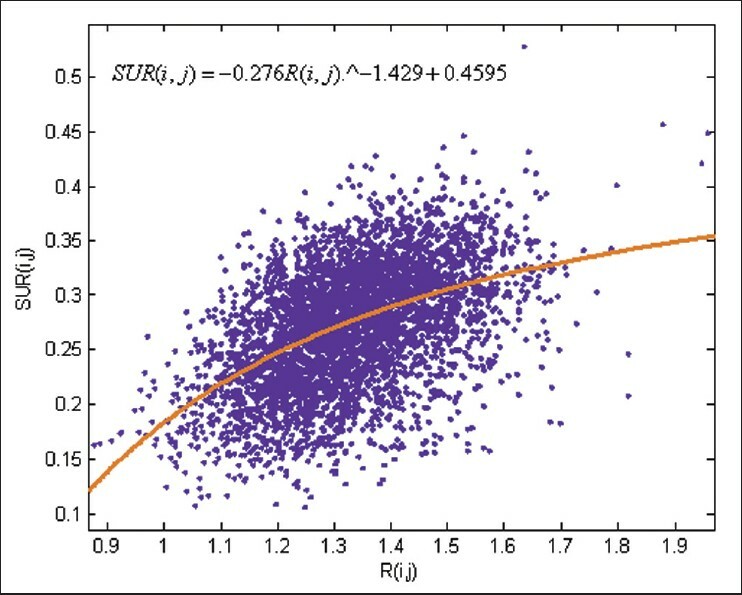 Based on the narrow windows used in this approximation, 4.6% of the photons detected at 154 keV are the scattered photons and the relative difference between the number of unscattered photons at 124 keV and 154keV is 10.67%. The number of scatter photons estimated using this triangular area is 838.25 representing an underestimation about 10.54%. The RNB for the corrected images is 0.0412. The improvement in the image contrast resulting from this method for the sphere 1, 2, 3, 4, and 5 is about 24, 18, 14, 10, and 4.6% respectively. The SNR, for all of the cold spheres in the corrected images is higher than the uncorrected images. In this study, the six scatter correction methods based on setting two or three energy windows in 99m Tc spectrum were evaluated using the three criteria. Among these correction methods, two methods DEW and CRM involve the calculation of the mean values for one (k) or two parameters (G and H). Since each pixel in the projection image has an individual value for these parameters, that is, lower or higher than the calculated mean value, therefore the use of these mean values results in undercorrected or overcorrected images. This is important especially for parameter H with a relatively big SD. On the other hand, the PEDA and DPW methods need to determine an optimal cut-off energy between the two subwindows and the values A, B, and C for the regression relation between R(i,j) and SUR(i,j), respectively. According to the results obtained, it is not possible to determine the cut-off energy in the PEDA method so that the number of scattered photons for all of the pixels in the scatter projections of the two subwindows is closely equal. Also, the regression relationship obtained for the DPW method cannot approximate the relation between R(i,j) and SUR(i,j) correctly. Finally, the TEW methods do not need to calculate any additional parameter, and therefore the correction can be implemented directly on the pixels of projections. But these methods also leads to over- or under- estimate the scatter counts in the photopeak window. 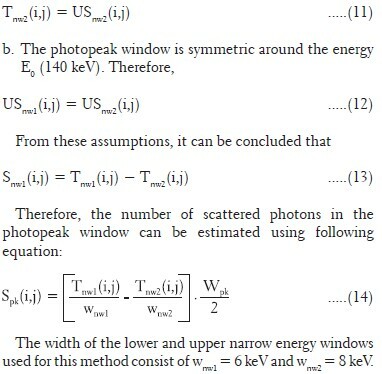 Thereby, it can be concluded that none of the six scatter correction methods investigated can estimate the number of scattered photons in the photopeak window closely. The TEW1 method for cold sphere 4 (an increase of 14%). For the DPW method, contrast improvement of the five cold spheres is lowest. The CRM and TEW1 method perform a nonuniform correction (the contrast improvement of cold sphere 3 is lower than that of cold sphere 4), this is clear specially for latter. For the two methods TEW1 and DPW, the SNR of the five cold spheres is lowest and highest respectively. 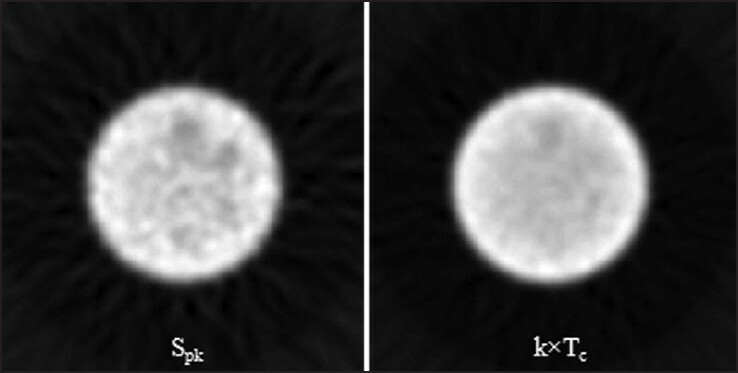 The SNR of the five cold spheres resulting from the DEW and TEW2 is very close to the SNR for uncorrected images. 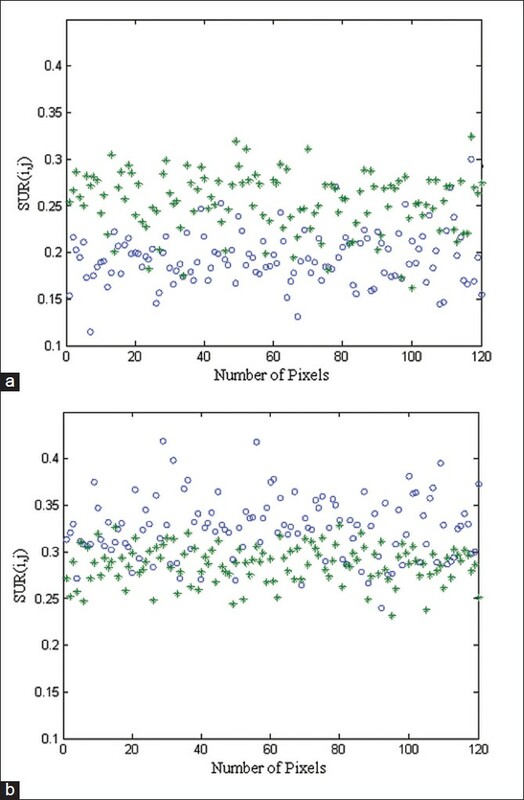 Plots of the pixel counts of the true unscatter projection against the pixel counts of the projection corrected by different scatter correction methods have been shown in [Figure 8]. 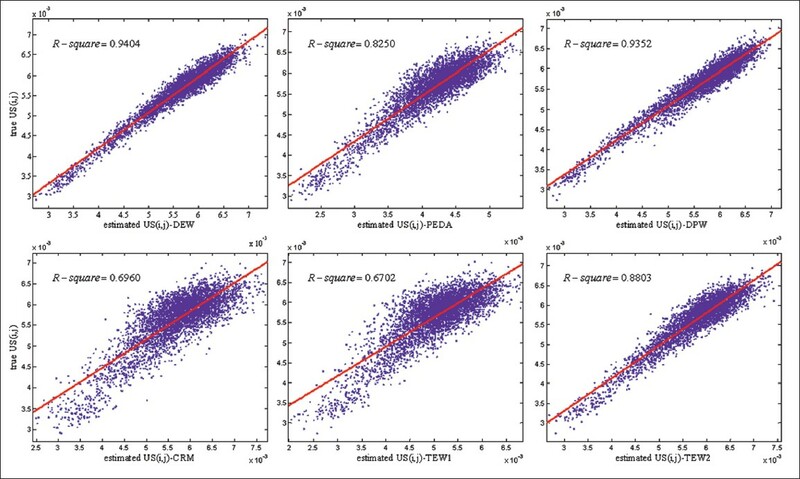 From the R-square of these plots, it is obvious that the DEW and TEW1 methods indicate the best and worst match between the estimated US(i,j) and the true US(i,j). From the results obtained in this study, among the six correction methods evaluated, the TEW method using triangular approximation (TEW2), because of the ease of implementation and uniform performance, the good improvement of the image contrast, the low RNB, the SNR higher than the uncorrected image, and the good match between the true unscatter counts and the corrected counts, is suggested as the most favorite scatter correction method. However, if a presupposed k value (for example originally suggested k value of 0.5) is used for the DEW method, this method will be also an appropriate choice for scatter correction. 1. Zaidi H. Quantitative Analysis in Nuclear Medicine Imaging. New York: Springer Science Business Media, 2006. 2. Zaidi H, Sgouros G. Therapeutic Applications of Monte Carlo Calculation in Nuclear Medicine. Philadelphia, Institute of Physics, 2003. 3. Saha G. B. Physics and Radiobiology of Nuclear Medicine. 3 rd ed., New York, Springer, 2006. 4. Jaszczak RJ, Greer KL, Floyd CE Jr, Harris CC, Coleman RE. Improved SPECT quantification using compensation for scattered photons. J Nucl Med 1984;25:893-900. 5. Jaszczak RJ, Greer KL, Floyd CE, Coleman RE. Scatter compensation techniques for SPECT. IEEE Trans Nucl Sci 1985;32:786. 7. King MA, Hademenos GJ, Glick SJ. A dual-photopeak window method for scatter correction. J Nucl Med 1992;33:605-12. 8. Pretoris PH, van Rensburg AJ, van Aswegen A, Lötter MG, Serfontein DE, Herbst CP. The cannel ratio method of scatter correction for radionuclide image quantification. J Nucl Med 1993;34:330-5. 9. Ogawa K, Harata Y, Ichihara T Kubo A, Hashimoto S. A practical method for position dependent Compton-scatter correction in single photon emission CT. IEEE Trans Med Imaging 1991;10:408-12. 10. Buvat I, Rogriguez-Villafuerte M, Todd-Pokropek A, Benali H, Paola RD. Comparative assessment of nine scatter correction methods based on the spectral analysis using Monte Carlo simulations. J Nucl Med 1995;36:1476-88. 11. Axelsson B, Msaki P, Israelsson A. Subtraction of Compton-scattered photons in single photon emission computerized tomography. J Nucl Med 1984;25:490-4. 12. Floyd CE Jr, Jaszczak RJ, Greer KL, Coleman RE. Deconvolution of Compton scatter in SPECT. J Nucl Med 1985;26:403-8.